It’s that time of year when all us Digital Nomads review what’s in our bags, read Tynan’s annual Gear Post and then make our own respectively. A couple of notes. First, there’s one typo in the video – spot it and you win a prize… not really. Second, I forgot my little earbud handsfree kit. It goes without saying that my guitar goes everywhere with me but I don’t need to do a “What’s In The Guitar Case” video do I? I’ll give you a clue: it’s a guitar. As you can see, I’m in a beautiful house-sit at the moment, which means I can do unheard of things such as get the 2 for 1 offer on milk, since I can KEEP IT IN THE FRIDGE!! However, crazy as it sounds, I’m finding that I use my Life-bag as normal. Even living in a house, I live out of that bag, keeping what I don’t carry in the van mostly and then swapping things out, including my spare trousers, umbrella, raincoat etc. The result is that when I want to go out, I don’t have to get ready to leave the house, I just grab the whole bag. Any questions I’m happy to answer. This post is both dull and interesting depending on how you look at it. I spend a bunch of time on geeky stuff like this, so I can get it sorted and move onto the creative things in life, so here’s hoping my geeky research can be informative for likeminded fools/heroes. Here are the details to go with the video. I’ve included brands where it matters. I don’t like advertising products because there’s almost no such thing as an ethical product… but the way I see it, if there are any brands which I find support me to consume/carry less, and create a minimal lifestyle then those products should be shared. Big Bag: Osprey Farpoint 40 – the only Digital Nomad specific bag I could find in a shop to try, and it was well worth the money. Webcam: Logitech c920. My first video with it… it’s an improvement from the inbuilt or my standalone. Clothes: Brands don’t matter as long as everything that can be wool IS wool and fits you. Packing cubes: eBags – recommended. Hard drive: Lacie rugged – totally droppable! iPhone Mic: iQ7 – a clear upgrade from the iPhone mic, for music, but not a replacement for a recording studio. Camera: Sony Cybershot II – from 2009, yet still doing ok apart from short battery life. I’ve bought 3 batteries for it that I charge in the van. Penknife: Victorinox – the big one. Mouse and Keyboard: Mouse is random. Keyboard is Anker and trumps the apple equivalent in all ways. Mini Tripod: Joby Gorillapod – tough, magnetic, flexible and worth the money. Noise cancelling headphones: Bose QC25s – good enough for mixing audio. I wouldn’t compromise by using in-ears. Phone: iPhone 5s. I do hate recommending apple, but they have served me well I’m afraid. Boots: Made by Chuckles Shoes, Exeter. I had them made before I was a minimalist traveller, which is why I didn’t consider weight at the time, but they are a first rate and I’m having them make a lighter pair soon. Someone: What’s it like living like you do? Me: Easy and difficult, but in all the right ways. Autumn is certainly here. I’m sitting on the bed in my van, which is covered in the Sami tribe’s finest reindeer skin, wearing three layers of wool. The light is dimming and I’ve lit a single candle. It’s 11C indoors according to the wall-mounted thermometer. Life is currently slow, stable and peaceful. I’ve no source of heat in my vehicle and no plans for a winter let or similar but I’m strangely un-phased by the uncertainty. 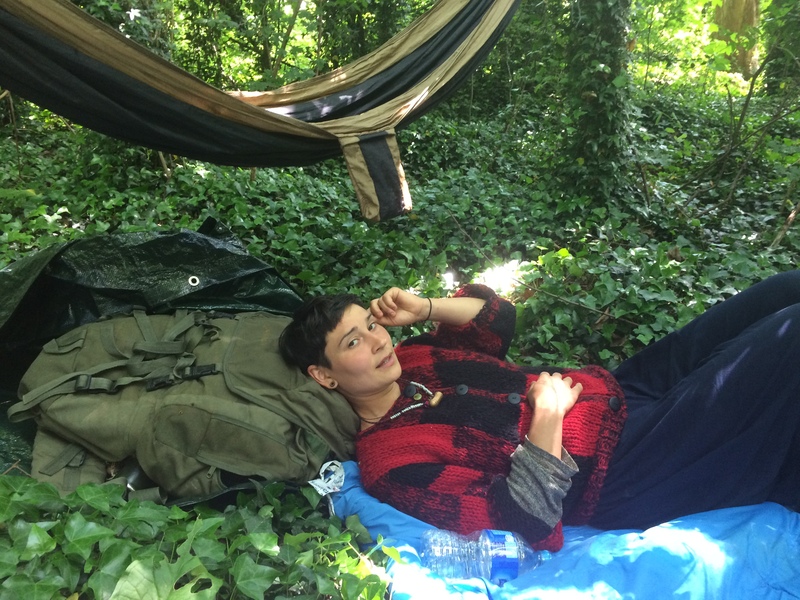 This update is to give a snapshot of my life, living and working “houseless” in the UK. The new term has started. 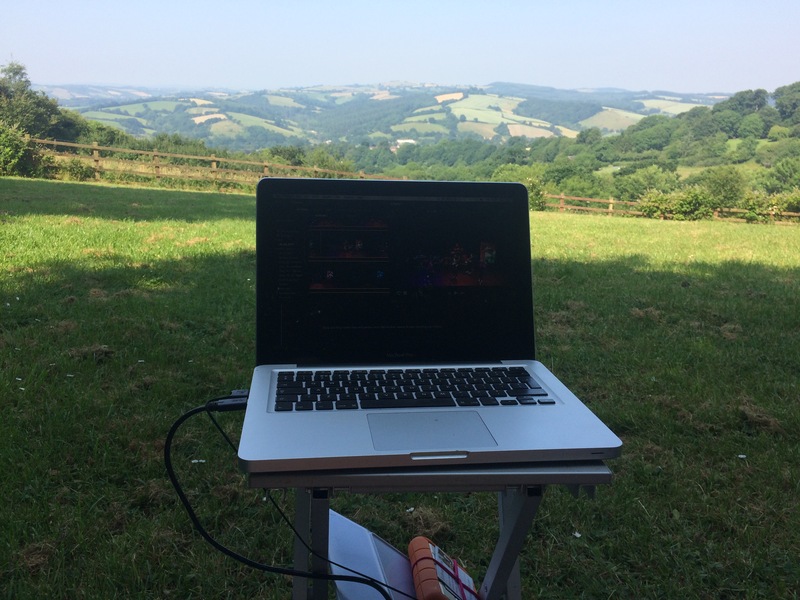 I have one full day’s Skype teaching, which in theory I could do anywhere in the country, or the world, but I’ve found that rock-solid-stable internet connections are hard to find (I hate to say it, but Virgin are the only ones I trust). As a result, I usually end up working at the college itself in Exeter, where I’m generously provided an office for the day. There’s also an admin day, but this is more flexible and can be done from anywhere, including my van through phone tethering. 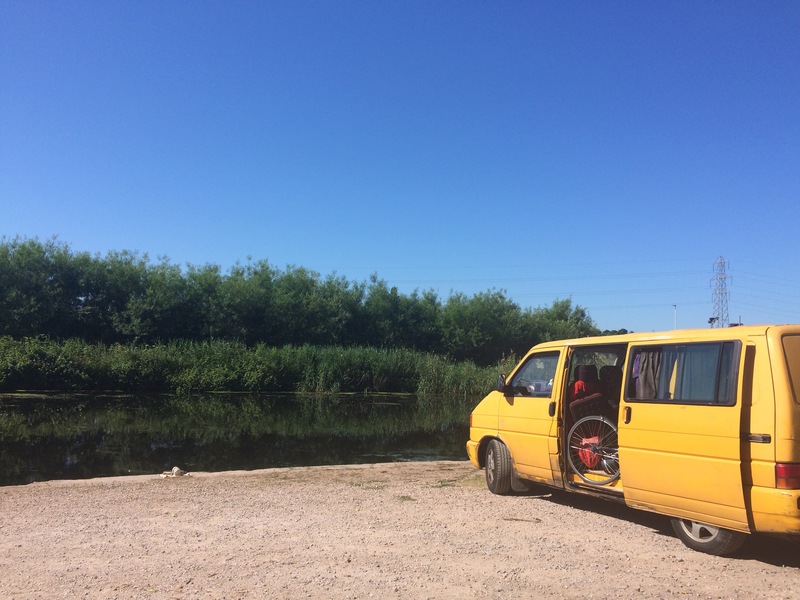 When I first moved into this lifestyle of van+improvisation, I had imagined myself travelling all around the country, sleeping in a different place every night. Not so. As it turns out, I orbit Exeter and enjoy the beauty of Devon. My van is not equipped for full time living, so I often stay over with a handful of friends on rotation, on a basis that works for them. This is something I call “docking” and each relationship is individual and always evolving. Cat-sitting the most affectionate cat in the world. I’m loving this way of life and I’m not thinking of giving it up any time soon. Why? Well, maybe one way to explain it is this: it hit me only the other day that my annual income is currently the same as it was when I first entered the working world 10 years ago. Yet, back then I was renting and struggling for money. I distinctly remember putting a sign up in the post office asking if anyone had spare allotment veg because I couldn’t make my grocery bill. Just think what a struggle it would be to live on the same money now in the same situation? Now, I live without rent. I am careful with money and although I undergo what other people might call hardships, such as sleeping in an unheated van, I am able to do many of the things that I love. For example, I can to afford a 5-7 day trip away from Exeter every 6 weeks. This would have been out of the question back when I was renting. It’s worth noting however, my earnings are not based on a 40hr week. My Skype teaching role is roughly 20hrs, 30weeks per year. Maybe another 10hrs per week go on my non-teaching paid work – gigs, recording, misc, self-employed promotion. Working part time, may result in low earnings (for a professional) and therefore Nomadism, but the lower hours also give me time in my week to be creative. This is invaluable. Another factor that gives me more time is the inherent minimalism created by nomadism (though my friends would argue this is also my character). Wait a minute.. minimalism creates more time? Yes it does. Having less stuff means less time spent sorting it out, fixing, replacing it etc. It also means being able to afford higher quality stuff on the same budget, since you’re buying fewer things, which means they last longer, which means less time spent shopping. I can’t imagine going back to dealing with having more things, in fact I often crave the simplicity that even less would bring. Sometimes I long for the “ultimate” everything – the best lightweight laptop, moulded in-ear headphones, flashy camera and high performance clothing that would no doubt half the weight of my backpack. But, in fact, my honed minimal amount of mid-range, half-decent kit is really very functional. I’d also hate to have to turn down little gifts from my friends because I’d decided to be super-strict about pack weight. I know a lot of minimalists go that far. So that’s about it for now. 9 months in, all is going well. Life is much more stable and grounded than I had imagined, or perhaps I’m just comfortable with the uncertainties this life brings. There are challenges (like what on earth do I do when my van is at the garage? ), but I guess they are the challenges that I welcome. 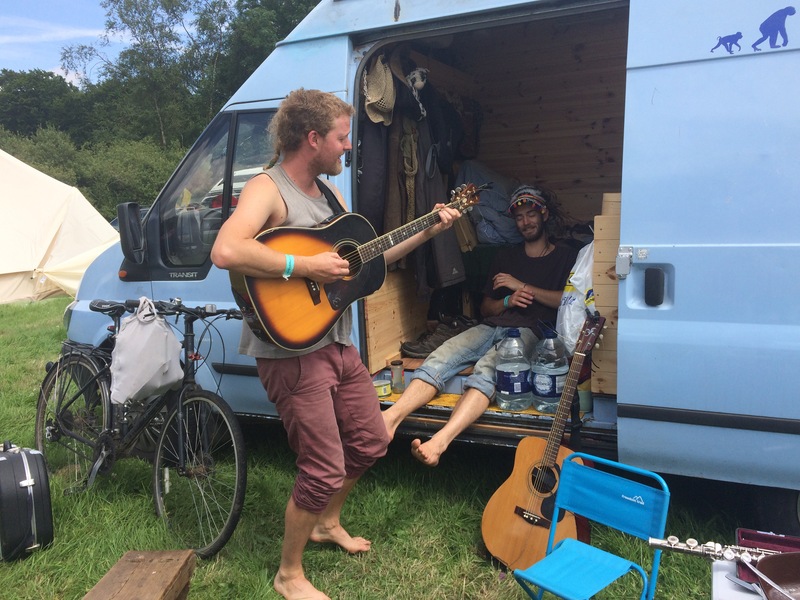 Van Living Offline: If It’s Not On Instagram, Did It Really Happen? Usually I’m the odd hippy in the corporate world, working as a university lecturer on Skype, living in a van/house-sitting. Now that summers on, I enter into being the odd Digital Nomad in the world of offline-van-dwellers and travellers. Alternative lifestyle blogs are unusual because people are usually either doing it, or writing about it, not both. As I know from my yurt days, it’s hard to get online when you’re off-grid. A quick visit to any festival van field shows me a different world. 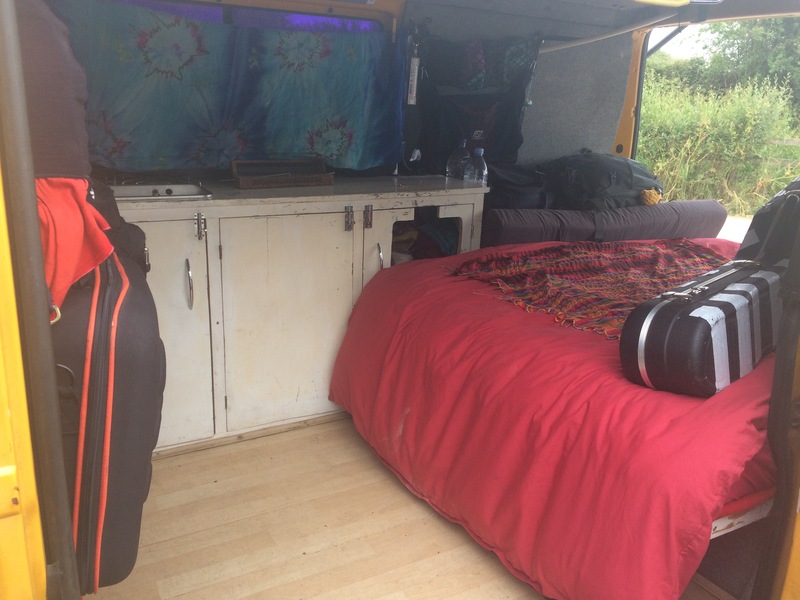 Whilst my colleagues are often shocked to discover that my Vansion neither has a water tap nor fridge, rock-n-roll bed, nor toilet, this setup comes as standard for van-dwellers who self-build. Why would you want to replicate a house in a van? Fridges need power. Water tanks are a hassle compared to bottles. Fold out beds are for holiday makers, and lastly, when you live a in 65sqft box don’t poo in it! What’s inspiring to me about chatting to the folks who live almost totally offline, is learning about the wide range of lifestyles available. It’s so easy to think that you need to be online to make a living. What’s rule one of starting your own business? Answer: get it on social media of course! That’s what we’re used to thinking anyway. Even during my £0 Challenge of 2014, I survived largely by making sure I stayed online. Yet there are alternatives. As musicians go, they all outstrip me; of course they do. Full time buskers are hot as hell on their instruments because they play for hours per day. They don’t have space in their packs/vans for tons of sheet music, but they don’t need it because they are constantly learning new tunes from each other. I only have to sit with a van-dwelling busker for 5mins and they’ll teach me a song so we can play together. With that and seasonal work, they get by more than fine. Me: Thanks for the great meal Jake. Lovely to have loads of veg after a few days travel where it’s hard to get it. Me: You too? I thought you just travelled from organic farming community to organic farming community. Jane: Well, yes but… via service stations. This reminds me of the folk I met who were hitch-hiking and ended up stranded at a motorway service station for so long they set up camp in the woodland just off the carpark. There is a myth that the offline world doesn’t really exist. If you can’t google it, or there isn’t a photo on Facebook to prove it, did it really happen? My income is online; I straddle two quite disparate worlds… and I like that (“I love my hybrid nature – no binary can contain me!” – Meredith Tea ). But it’s refreshing to see people making their way in the world through offline networks, or at least a real mix between the two. The online world isn’t as dominant and powerful as all that: whole worlds still function under its radar. Over the past few years, I’ve given up so many things I thought I needed, and have felt freer each time. Being immersed in the offline world, even for a short time, inspires me to ask “What more I could free myself from?”… I’ll let you know when I have the answer. Summer’s here and I’m finding myself drawn to the river more and more, spending less time in houses and more in the van. Partly, university has finished for the summer, so I’m not tied to a router for teaching (on Skype), and partly the weather’s great. It’s time to set up the van more as a living area than purely the sleeping/storage area it was before. Thought I’d share my developments with you. 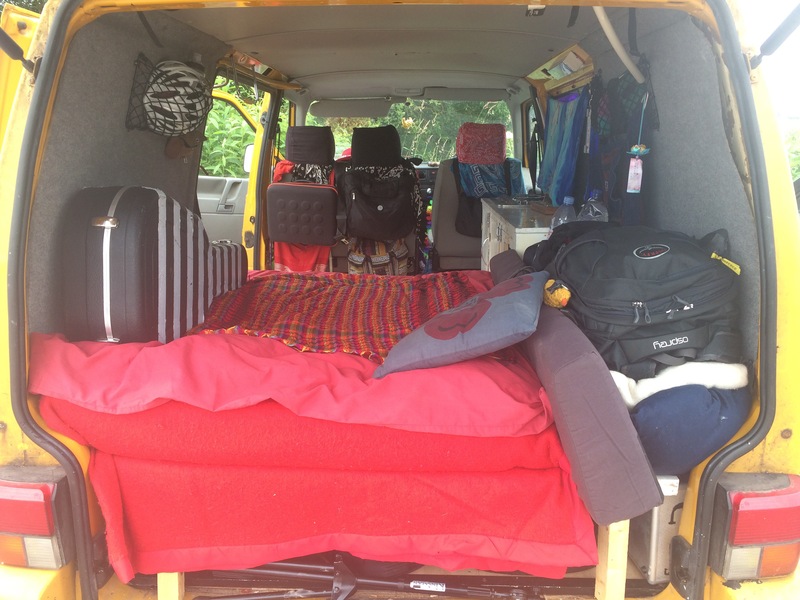 Over the weekend I visited a T4 with a proper conversion – pop top, running water, fold out bed. “Ah” I thought, “this is why my life doesn’t work so well”. In contrast, I’ve just got a short bed, and a set of cupboards. I do have a gas ring and leisure battery though. Today I set about an improving on my already chocka set-up. But to my horror, I actually needed to add MORE stuff; to devote cupboards to food, kitchen stuff, 5ltr water bottles and other living items. How to make room? 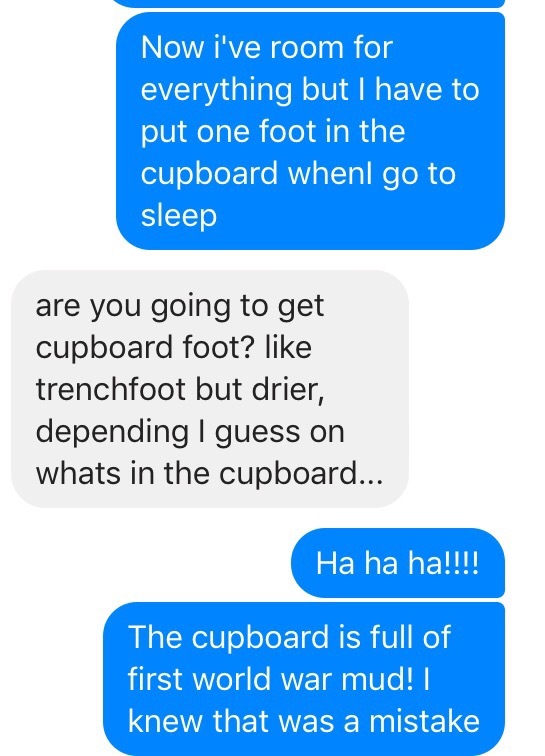 In the end, I decided to give up a portion of the bed, leading to this conversation with a friend. You can see on the right where I’ve put a load of stuff – that used to all be bed. 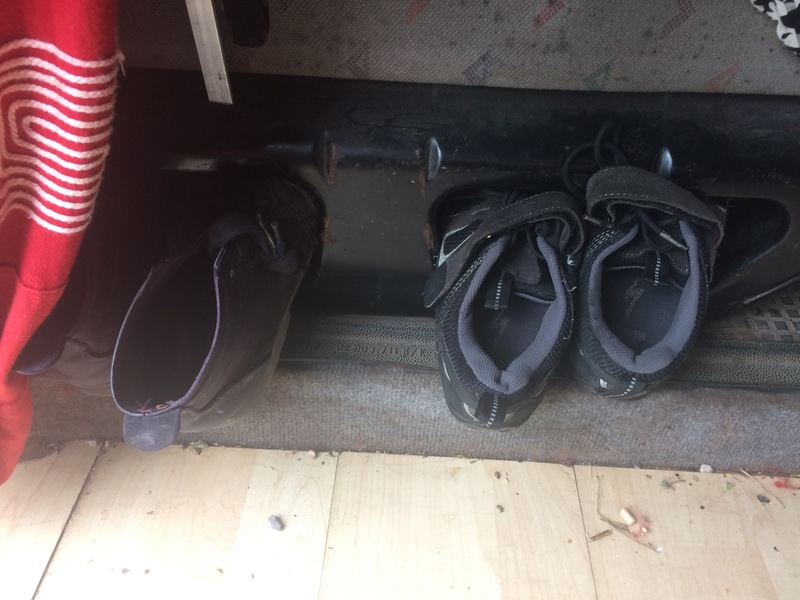 It was a real pinch trying to find space for everything, but my favourite new discovery is that the van came with an in-built shoe rack all along! There never seems to be anywhere to put my guitar away, but maybe it being constantly in the way will make me get it out and practice more. Will keep updating on how the new setup goes. I would still like to be able to find a way to wash myself or record music out here, but it’s been liberating to find that the weather is warm enough for me to use the world as my living room, for work/play/practice. Roll on summer! After a week of sleeping on the floor, results are as follows: Although I have adapted somewhat to floors, they are still not as good as good beds, but better than bad beds. These terms are subjective of course – good does not mean expensive or bad cheap. A good bed is one that’s comfortable for me and a bad one isn’t. Therefore, I think I have solved my sleeping problems thusly – wherever I am, if I like the bed I can sleep in it, and if I don’t like the bed I can always sleep on the floor and know it will be fine. Additionally, I can now potentially enjoy camping better and try sleeping on the van floor so I can be fully stretched out. The only problem I can foresee is whether someone would be really insulted if I slept on the floor instead of the bed they offered me? I suppose I could just put it down to eccentricity? Speaking of eccentricity, last night my friends slept in a tent pitched on the only available flat space they had – a trampoline. In some circumstances this becomes the most logical course of action. Things got stranger when it became obvious that to avoid puncturing the trampoline a shoe should be placed under each corner, making the whole thing look like a fantastical bouncing creature filled with teenagers. In the past I’ve beed crap at getting a good sleep on hard surfaces, and jealous of those who can sleep anywhere. This is what my research has turned up. Lying on your back, no pillow, allows the body to support itself with no neck cricking. Lying on your side isn’t comfortable, but after a few nights the body gets the idea and stops trying to turn over. The body adapts over time – so the floor that felt almost painfully hard on night 1 felt much more like it was simply a hard mattress by the end of the week. Point 1 I believe explains why bad beds are worse than floors. Basically your body needs support, and a good bed will provide that, whilst the floor allows the body to support itself. A bad bed however, is one that provides some support but not enough, whilst getting in the way of the body’s natural posture that would allow it to support itself. Finally, I’m interested in whether, through this practice of sleeping on floors I’m re-connecting with my oriental heritage, where sleeping on thin mats on the floor is cultural. I feel empowered and freed by the idea that by sleeping on the floor I could sleep anywhere, and this reminds me that my mother did the same thing as a teenager. In fact, I might never had been born if my mother had not been willing to floor surf during her final years at school. Why? Because staying with friends was the only way she could find peace and quiet away from her chaotic, destructive parents and study. She excelled at exams, and was accepted on the UK nurses training scheme in the 1970s. Later, through nursing she met my father (who was having his tonsils out). None of this would have been possible if she hadn’t been able to sleep directly on hard floors. So in a sense, as I learn to do this, it feels as though I honour my mother’s determination and my history. 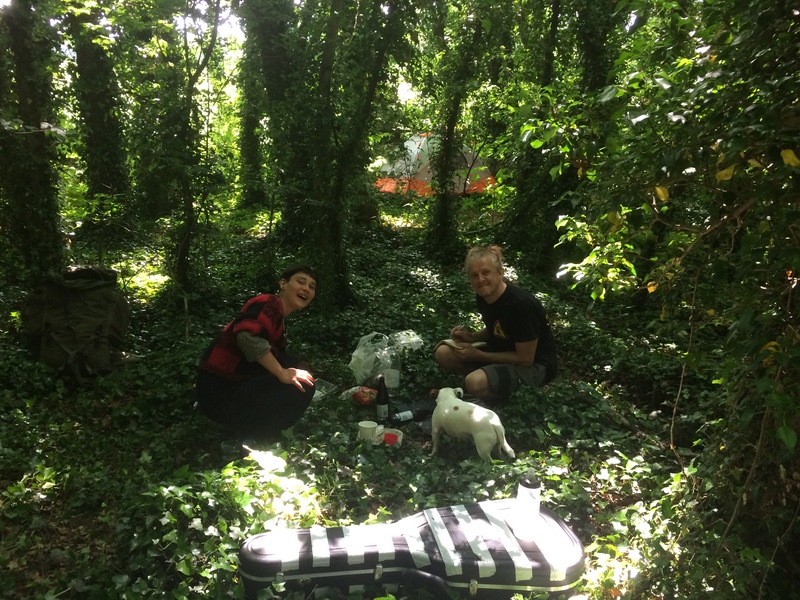 After another bad night’s sleep in the van, on that dreaded piece of foam I found by the roadside on Crammond Island a few years back, I decided enough is enough: it’s time to take some action regarding the surfaces I sleep on. Being a Digital Nomad means “sleeping around”: staying with friends, housesitting, van livin’ and more. I never know what I might be sleeping on, from the luxury master-bed, to cushions on the floor. I mean no disrespect to the hospitality of my hosts, who are always generous, caring and sharing, but I’m asking myself how I can take responsibility for making sure I have a good night’s rest each night, on a bed that suits me. One age old traveller solution is simply to take camping kit everywhere, even if this means ridiculously rolling out your favourite camping mat next to the guest bed in a friend’s house. Why? Because it’s the bed you’re used to and will therefore sleep best on. Yes, I could buy a top of-the-range lightweight inflatable mat, but maybe there’s another way to guarantee a comfortable and consistent sleeping surface wherever I am: to learn to sleep on the floor. Let’s get this straight: I’m only going to do this if I find it comfortable. I’m a minimalist, not a masochist. BUT, if I could truly get used to floors, they are everywhere. I’d have the most flexible sleeping solution possible, since they also have floors at airports, train stations, parks and fields. I could ditch the bed in the van entirely, giving me more space. There are claims that this can be better for your health and sleep quality than sleeping on a bed, but really, with so little evidence, the only way to find out if that’s true for me is to try it. Previously when I’ve had to sleep on floors it’s been unequivocally pointless on every level, but this could be because I habitually sleep on my side and use a pillow. Well, I can’t say that was a great night’s sleep, but actually, falling asleep on the floor wasn’t that hard. As soon as I lay down without a pillow I noticed that my head actually comes equipped with a flat bit at the back, seemingly designed exactly for the purpose. I was surprised to wake in the morning to find my neck didn’t hurt, and neither did my lower back. The only problem was that I kept waking up every time I tried to turn onto my side out of habit. According to my research, my body could well stop doing this after a few days, so I’ll just keep persevering. Some parts of my back do hurt, but then those bits hurt before I even went to bed, having slept on that rubbish piece of foam in the van the night before. So, the experiment continues. Will report back in 1 week to tell you the results. Finding happiness on the road all depends on which road you take! What’s a week away from home when you’re homeless (houseless) anyway? The past week has brought home to me the difference between travelling and “living in transit”. I’ve been away from Exeter, the main city I nomad around, for a trip which included work, play, misc and a total of 3 cities including London. Travel is a word that usually refers to a temporary trip, during which normal life stops and another sort of world takes over. In contrast, living in transit involves taking even the mundanities of life on the road, and our careers or life paths keep developing as we go along. Unlike gap years or extended holidays, there is no “I’ll do it when I get back”. The question I asked myself before the week started, was “how can I come up with a sustainable method for travelling? How can I avoid getting exhausted or burnt out?” By the time the week was out, I’d realised there was no such thing as a sustainable “method”, only a sustainable “approach”. I’d intended to set boundaries to make sure I didn’t end up working intensely long days, with hours on public transport thrown in, get too hungry, or exhausted. The reality was, that too many factors were out of my control for this to be possible. I did work long hours, get overtired, skip meals, sleep in weird places and get a crick in the neck, but I also managed to take opportunities along the way to recover. The only full day I had to myself in London, I slept rather than seeing the sights, because I knew I couldn’t return home tired when “home” means “moving from sofa to sofa”. The key is, to make the best of every opportunity, and find what you can do right this moment, rather than focusing on what you can’t do. One thing I love about this approach is the constant presence of mind it requires. To move through the world in this way, I need to be constantly paying attention, and making the most of the opportunities each moment provides. For example, on the morning before my train back to Exeter, a great opportunity came up for my friend and I to cut each other’s hair, which turned a task which is usually a hassle, into a beautiful chunk of time to be close with them. What did work beautifully was my new bag and kit setup. I’ve put so much time, thought and money into this system I was beginning to wonder if it was just another distraction or excuse. I mean surely you don’t need kit you just need an adventurer’s spirit, right? …and yet the rule is, no matter what bag you have you’re going to try and max it out beyond capacity. Well, an adventurer’s spirit is good, but the right kit has been a real game-changer for my travelling. It’s saved me time, pain, and money*. Check out my gear post. This trip didn’t require any recording kit, so I had plenty of extra room in the bag to pick up groceries or carry food/drink. I was carrying more weight than ever, but with no back and shoulder pain, due to the more comfortable backpack. One place I stayed at required me to clear the room I slept in every morning. This was dead easy because my new bag is clamshell meaning you can access its contents without “unpacking” it. So moving rooms was as simple as zipping it closed. So what’s my new approach to life in transit? To abandon ideas of routine, dicipline, making plans or forcing my will, but take available opportunities to meet my own needs, give to and connect with others. I’ve discovered that being willing to explain my needs makes people feel more comfortable with me in the long run. At the same time it’s important to be physically prepared with the right kit, and mentally prepared for lots of changes of plans. Something little like always having an extra snack handy and all my devices charged is enough to get me productively through a couple of hours of unexpected transport delays and come out fresh as a daisy. In a nutshell, be mentally flexible, physically prepared, sleep when you can, and try your best to let go of anything else. Lastly, be present: it’s the best way to make every minute count. BuyMeOnce stocks things that last a lifetime: Brilliant for Christmas Shopping! Most who know me would be shocked to hear that I’m actually recommending a shop, but this one is really something special! When it comes to my issues surrounding buying brand new “stuff”, Christmas and otherwise, buymeonce.com solves all of them, with their commitment to sell products that will last a lifetime. This website gets the Symphony For Happiness seal of approval! The stress of “what to buy” seems like such a “first world problem”, and of course it is, but this is why it’s so important. As western over-consumers we can make a huge impact when we make the decision to consume responsibly, so let’s do it. When I buy something new (meaning I can’t make it or find it 2nd hand) there are a number of things to consider. Is it sustainably made (both processes and materials)? Does it serve my purpose? Is it reasonable value for money? Figuring all this out can be a real nightmare, both in terms of getting the info and weighing it up. How do you know if a product will last? What good is buying something made from sustainable materials if the damn thing just breaks and has to be thrown away? What if something’s ethically made but actually doesn’t work very well? I’ve also seem plenty of sustainably produced disposable items, which seems to me to defeat the point. BuyMeOnce takes the headache out by having done the research for you, weighing up these factors and presenting the info on a plate. It’s worth bearing in mind that whilst some of what’s listed is sweatshop free, sustainably produced, or recycled, the main focus of the website is longevity. “Buying once” makes sense in so many ways. On a personal level it can save both money and time, since you’ll never have to re-buy, and over a lifetime this will be cheaper if you can afford the initial outlay. On a planetary level, long lasting goods are naturally more environmentally friendly, since less units are produced, saving on materials and other polluting factors involved in the production line. In terms of Christmas presents, buying from this website would ensure that you’re giving a loved one something that won’t break on them, but as a personal note, I’d recommend discussing your gift with the receiver before ordering. After all, if they are going to be stuck with it for life, you’d better check if they’d prefer the red socks or the blue ones! My only criticism is that there are plenty of categories that BuyMeOnce doesn’t yet cover. However this in itself is a symptom of one of their core strengths – taking the necessary time to rigorously research every item before making the commitment to list it. I’ll be watching as they grow and expand. When I have to buy something I’ll often scour Digital Nomad Kit Lists, since our breed are terrifying testers of our possessions. We carry few things and no spares, so we can tell you exactly how well each thing performs, how reliable is it, and how long it lasts under relentless daily use. I wonder if in future I’ll start seeing collaborations between buymeonce and digital nomads. Brands I see both referring to already include Darn Tough and Patagonia. For more of my thoughts on Christmas Shopping, click here: Christmas Gifts – I saw this & thought of you / I thought of you… I saw nothing. I am a minimalist because I LOVE stuff. This is the clash I seem to have with the minimalists I read about who don’t care about stuff. However after 5 years of reducing I’ve finally understood WHY I’m a minimalist who loves stuff, and what it is I’ve been trying to achieve. Those of you who don’t like the word energy might turn off at this point, but hear me out. If you don’t like that word, try sentimental value, or Marie Kondo’s “Spark joy” concept*. When I use and wear things on a daily basis which have this quality, I literally feel like they are transmitting healing me. Sound crazy? Let me explain more. Something made from natural materials (which I believe take energy well), such as wood, wool, cotton, metal. Something made from plastic/synthetic materials. Making my watch strap took 1hr and produced a much warmer result than buying factory-made. Even if you’re not familiar with the concept of energy, can you relate this to your own life? Look around your home. Do you have more positive thoughts and feelings about by a handmade gift from a friend than you do for, say, an empty juice bottle? If nothing else, the gift at least holds warm associations. To be surrounded by these things is to be surrounded by our warmest memories, thoughts and feelings. Everyone has a “special” or “favourite” something. What if everything you owned had that quality to it? If you habitually experience energy, these ideas might immediately resonate with you. Or if you’re simply curious, try picking up a pebble and carrying it in your pocket all week. Each night, take it out and hold it in your hand as you think of a happy memory from your day. At the end of the week, can you perceive a denser positive energy in that stone? I use this knife for all cooking even if it’s ‘the wrong tool for the job’, such as for grating cheese or cutting bread. I’d rather give my knife more use and therefore more energy. My perception is that natural materials take on energy better, but even something synthetic, with the right intention can become a “healing” possession or sacred object. For example, I have one gaudy polyester shirt which I bought 2nd hand as a joke. Strangely it suited me, and I ended up wearing it at my wedding, so now it’s one of my most energised possessions. For me, one of the biggest things that gets energy into an object is use. To use stuff more often I have to have less of it – the result is minimalism. This is why I only cook and eat with one knife, and have done for 5 years. Up until very recently I was doing this instinctively without understanding it. I’d upgrade something, like my rucksack, only to find myself taking the upgrade back to the shop and keeping the old one. I’d shy away from high tech traveller’s clothes, even if they’d make life easier, and stick to bulky cotton. My rucksack, originally bought by my mother for our only walking holiday when I was 7. The trip was formative for me, so I wanted to use the bag as an adult, but also strangely wanted rid of it. Finally I remembered that my mother hated the trip herself! Once I addressed the imprint her experience still had on the rucksack, I stopped wanting to replace it and started using it. Since I’ve fully understood that I’m creating a healing energy environment through “stuff”, I’ve changed tack and gone for it completely. I’ve got rid of stuff that I actually was using, because it wasn’t (and couldn’t be made) energy dense. Once rid of it, I could feel that even the energy between my possessions flowed much better. I’d no longer consider giving away highly charged items just because they are bulky (like hand knitted jumpers) but am cutting down on electronics. If I need to acquire something I’ll make sure it’s energy dense, by perhaps making it from found materials, or asking a friend to do it with me, or buying 2nd hand. If I have to buy something new, I might decorate it. I’ll also look out for long lasting things, giving me years to put energy into them. The result is amazing! I feel totally aligned and am truly supported by my possessions. This is not about loving stuff more than people. My stuff keep itself in check now, and I have more time for the people in my life. *A note on Marie Kondo: When I first read about Marie Kondo’s “Spark Joy” concept I was thrilled. With slightly different framing our ideas were similar, and she even writes about imbuing everyday boring functional objects with positive energy by complimenting them. What I’d add to it is that some possessions do not “spark joy” or are not positively charged objects because they either will not take energy or they have negative energy in them which needs addressing (cleansing). For example, if a loved one had a traumatic experience whilst wearing a piece of jewellery, then gave it to you, you may feel a heaviness, sadness or tiredness when touching it. However, the heaviness can be freed from the object, leaving only the warm intentions and generosity of your friend. Someone attuned will be able to tell if an object does not spark-joy because it needs discarding or because it needs attention. Also, whilst Marie Kondo relates that most people naturally end up with less stuff after her process, I would argue that in the case of making objects sacred, it’s vital to have few possessions and the fewer the better. As long as the functionality of your life is not compromised, interacting with a smaller number of objects more often ups the energy in each one.